The nave is the long narrow part of a Roman basilica or a Christian church – the part where people sit in a modern church. The word “nave” comes from the Latin word for “ship”, navis, because people in the Middle Ages thought a nave looked like the bottom part of a ship turned upside-down. Usually when people say the nave they mean the widest, center part of the church, between the main columns. The long corridors on the other side of those columns are called the aisles. 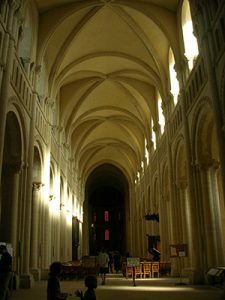 But sometimes art historians call each of those corridors a nave too, so that you’ll see books saying that Chartres Cathedral (for instance) has three naves. That just means that between the walls of the cathedral there are two rows of columns, and they divide the church into three sections. Some big churches have five naves – a big center nave, and two aisles on either side, separated by four rows of columns. Here is a floor plan of Chartres Cathedral, looking down at the church as if you were floating over it. 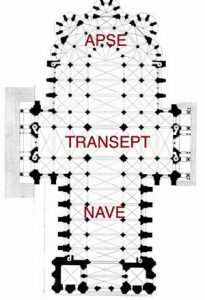 You can see the two rows of columns, and the three naves (or one nave and two aisles) between the columns, and the apse at the other end. In the Middle Ages, churches didn’t have chairs in their naves. People stood during the Mass, or they brought their own chairs. Cite this page: Carr, K.E. What is a nave? History of Architecture. Quatr.us Study Guides, May 24, 2017. Web. April 23, 2019.